Visibility/Location: The location was in a newer strip mall of sorts as MB Financial Park of Rosemont is a pretty well known location. HOWEVER, we couldn�t find it and drove around, asking people where we should park, then where we should walk to find the place. Would a sign SOMEWHERE be too much to ask for? Wait Entertainment: There was no line on the night/time we went, so no line entertainment. Ticket taker at the front door was in costume and did a decent job of setting the tone for the evening. Parking: $13 - While they did offer validated parking, this was not advertised, so most people attending will end up paying the $13 fee at the parking garage. Before heading out to Rosemont, I heard the complaints from last year�s Screams in the Park, so I was prepared for a horrible experience. Those complaints were high-end animatronics, coupled with no actors, made people feel like they were wandering through the Dark Zone at Transworld. So, color me pleasantly surprised as I walked through Screams this year because, while those high-end animatronics and props remained, none of the complaints about actors were justified. Instead, what was there was a worthy haunt this year. It�s like the owners actually LISTENED to what was said about them last year, and fixed what was broken. 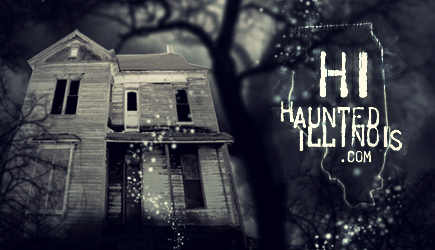 First, the bad: specifically the horrible was that we couldn�t find the damned haunted house to save our lives. Our GPS led me to a parking garage on the other side of I-294 from where the event was actually located. We figured out that we were in the long location (I didn�t think it was in a garage for a blood bank) and shortly got on the right way. However, as we traversed closer to the downtown area of Rosemont, no signs plus a lack of a GPS made it tough to find. I even had to ask a security guard where we should go and he told us where to park, then where to walk, but we wound up going in a complete circle. Also, another bad thing the owners are doing � he isn�t promoting the fact that the haunted house validates parking. That means, instead of paying $13 to park, you can bring your parking stub to the front door of the haunt and they will happily stamp it so you don�t have to pay $13. This would have been nice to know as I know of one person who did pay $13 to park/ We, on the other hand, heard that the haunt validates, had to run back to our car to get our parking pass, then run all the way back to the haunted house a second time to have the parking stub validated. It�s little things like this that are the difference between a good haunt and great haunt, especially when the inside of the haunt is as good as Screams was. And, yes, you read that right: Screams in the Park really is THAT GOOD on the inside. First some back story: Apparently, in 1985 Chicago Police unearthed horrific evidence of torture and multiple murders at the sprawling castle of H.H. Holmes. Masquerading under the guise of caring doctor and loving husband, Dr. Holmes was America�s first serial killer--who designed his home solely for the torture and disposal of human bodies. And, now, we were walking through it. Awesome back story and something that the owners really played off of well. The detail inside the haunt was high-end all the way. And, yes, before you say it� it was mostly store bought. But, lets be honest, there�s really nothing wrong with a store bought haunt as long as you mix it with the right homemade props to make everything look good. And, that�s exactly what Screams in the Park did this year with the design. They took their purchased set pieces and mixed them with hand made props and turned out highly detailed scenes that were a pleasure to walk through. For example, there was a wooded area where a store bought, large animatronic hand was trying to grab people� however, the owners of the haunt put thick turf on the ground, hand made trees, and cobwebs overhead to make you feel like you were actually walking through a swamp, and it was delightful from an artistic standpoint. In addition, the designers created scenes throughout that really helped immerse the customer within the scene. I wasn�t just walking through the concrete of the parking garage as I wandered through the scene. Instead, I was walking on dirt, or sod, or whatever to enhance the experience of the scene I was in. I was also ducking out of the way of a lot of burlap and other things from overhead that added to the feeling of walking through a haunt. While the walls were well coordinated with whatever was taking place inside. 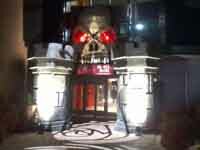 Seriously, from a design stand point, Screams in the Park did a decent job of making a great haunt. And, they weren�t just bodies taking up space. They were people who worked hard within their scenes to make the entire experience come a live. They worked hard, had lines that were spoken well, and hit their marks when necessary. Now, granted, some of the actors were over the top: for example, the guy who took the tickets was a bit over the top, or a crying woman and funeral director in a funeral parlor scene were pretty campy� or the weird scientist where an electrical chair was going off was a bit goofy, but the actors didn�t hurt the scenes at all and, most of the time, just made me smile as I walked out. The only REAL issue I had with the acting was that, as we entered �Screams in the Park,� a mother asked my group if her 12-year-old son could walk with us. Seems the woman didn�t want to go in, and the kid � who really wanted to see the attraction � didn�t want to walk through by himself. So, we agreed and �junior� became a 20-minute ward of Haunted Illinois. The actors tended to spend A LOT of time trying to scare him, as opposed to doing things for the entire group. For example, I would lead us into a room � lets say it�s one of the highly detailed longer corridors that were situated throughout the haunt. I would lead us down the hallway, followed by another adult, then the kid, and another adult taking up the rear. As we crossed the actor, the actor would look at me and do a low growl, then he�d look at the second adult and do another low growl, then he�d see the kid and the actor would basically jump out of his skin to scare him. He�d get in the kids face and say �I�m gonna kill you� or whatever� basically pushing the adults out to the way to get to him. To me, that�s the easy way out and the actor should do something to entertain the entire group. This happened in a lot of rooms along the 21-minute journey through the haunted house, to a point where I started to tell the spooks that there are �other people in the group� and we deserve a scare too. Worse, I also assume that these same actors would have done the same if a 15-year-old girl replaced the 12-year-old kid. Its safe to assume they�d go after the easy scare and ignore the adults, when they should, really, focus on the entire group. The only other gripe I had about Screams was the last two or three rooms seemed unfinished when we walked through. I�m not sure if the owner ran out of time, or props, but when we walked through, we walked through a room that had nothing on the walls, then into a room that had props leaned up against the walls with someone hiding inside, to another room that seemed like the exit. I seriously thought the haunt ended when we got into the first unfinished room, so I was like �What the hell� when someone jumped out of the room with the props leaning against the wall. But other than those extremely minor things, Screams in the Park really was enjoyable for me. The cost of it was only $20, which was on the lower end of the cost spectrum, and it took more than 20 minutes for me to walk through. However, some signage would do wonders to help the owners get customers in the door, and letting people know that parking is free would help fill up his queue lines even more. But, overall, Screams in the Park can easily be considered one of the most improved haunts of the year. I recommend it to anyone looking for a good time.